Turn Taco Tuesday into taco every day with this low-carb recipe. I was craving tacos this week, but I needed something lower in carbs. 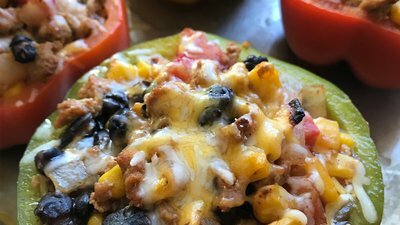 Enter these taco-stuffed peppers! There's something so crave-worthy about juicy, taco-seasoned turkey tossed with sweet corn and black beans and smothered with melted cheese. Yum. This is definitely a meal-prep option I will be using again and again. Not only is it delicious, but it's pretty darned easy too! These tacos keep great in the fridge for up to one week; just reheat them in the microwave for a couple minutes and enjoy. I don't recommend freezing them, however.